It has been said that, at its best, preservation engages the past in a conversation with the present, over a mutual concern for the future. 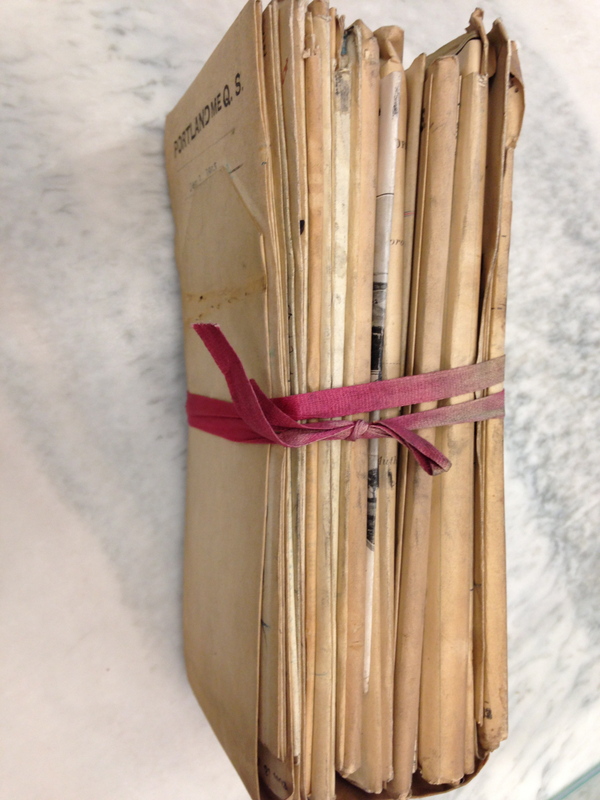 The original correspondence between the U.S government officials, local businesses, politicians, architects, contractors are retained between planks of cedar, tied with a red ribbon and wedged into a box at the National Archives in College Park, Maryland. I untie the ribbon and carefully unfold the documents – some written in the calligraphy of the time. Later letters were typed on onion skin paper. Although the local Portland businessmen and politicians at the time supported the government request to build the Quarantine and Immigration Station, they petitioned that the building not be on any of the populated islands of Casco Bay so as not to impact the budding tourism industry. Many of the immigrants that passed through House Island were bound for New York and Boston. They came for a better life – to escape oppression or persecution, to find religious freedom, to seek economic prosperity. They came hoping for a new life in a new land. They left family and friends and a familiar way of life. 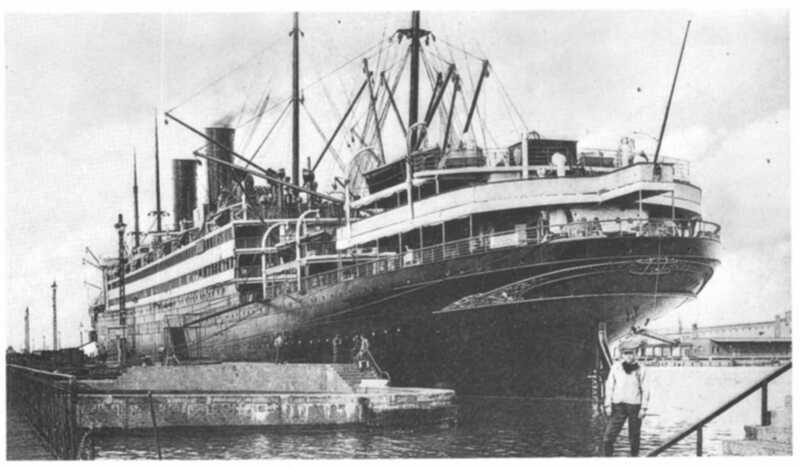 They traveled in steerage for up to 18 days. They arrived not knowing where they would sleep that night or where they would obtain a meal. 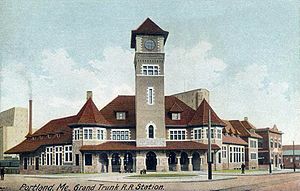 Those that ‘passed inspection’ by the Inspectors and Doctors on House Island were taken to Portland, placed on trains at the Grand Trunk Station and sent on to their intended destination. Those detained wondered if they would eventually be allowed to stay or be returned. Bela Gross was one of those immigrants. 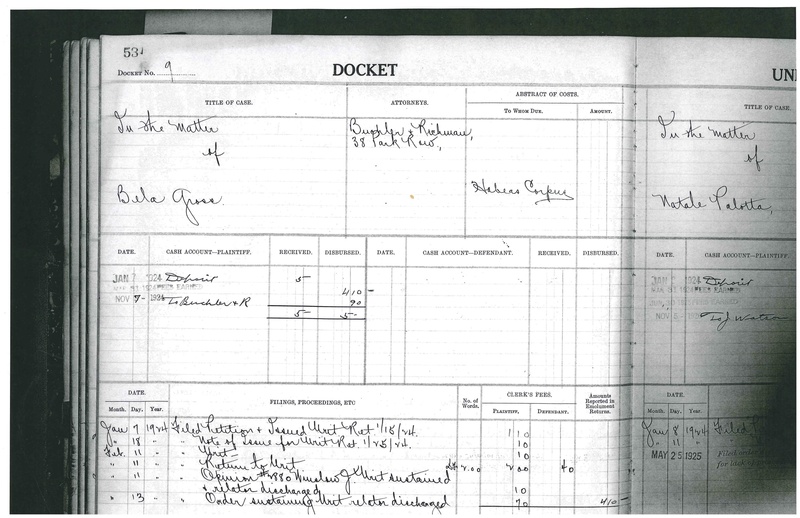 The Custom House Inspector determined – incorrectly – that the Russian quota had already been met. Allowing Bela to enter the US would exceed the quota. He denied entry. Is Rescued After Leap Into Harbor – Immigrant Feared He Would Be Unable to Enter U.S.
…After great difficulty, customs men rescued Gross with a line and he was taken to police headquarters. Deported from Portland and not allowed to return to France or Germany, Bela was detained on the U.S.S. America for several months. His fate would be determined by the filing of a habeas corpus suit in the Federal Court of New York by his uncle in Detroit. 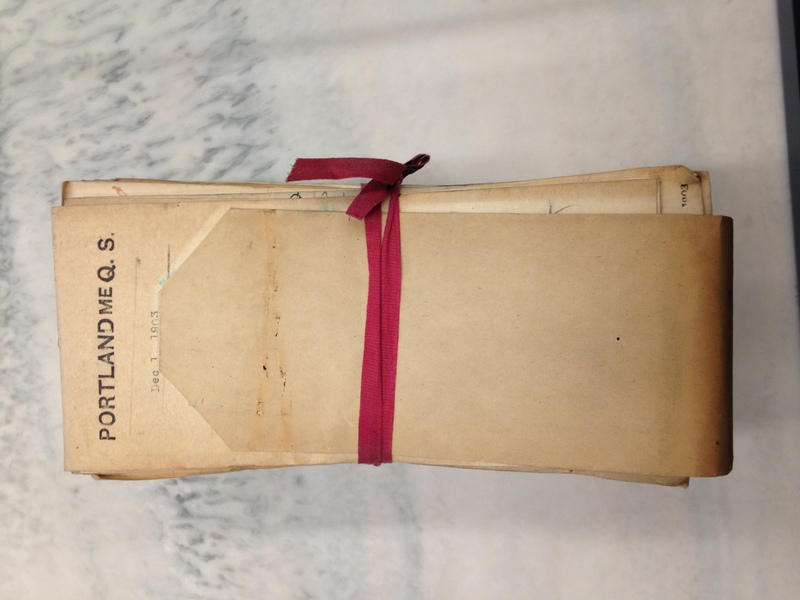 For $20.00 you can obtain a copy of the Federal Court files from the National Archives in Kansas City. The case documents includes a transcript of his interview, the filing by his ‘relator’ Eugene Reinitz against the Commissioner of Immigration, legal arguments and the rending of the decision by Judge Winslow. 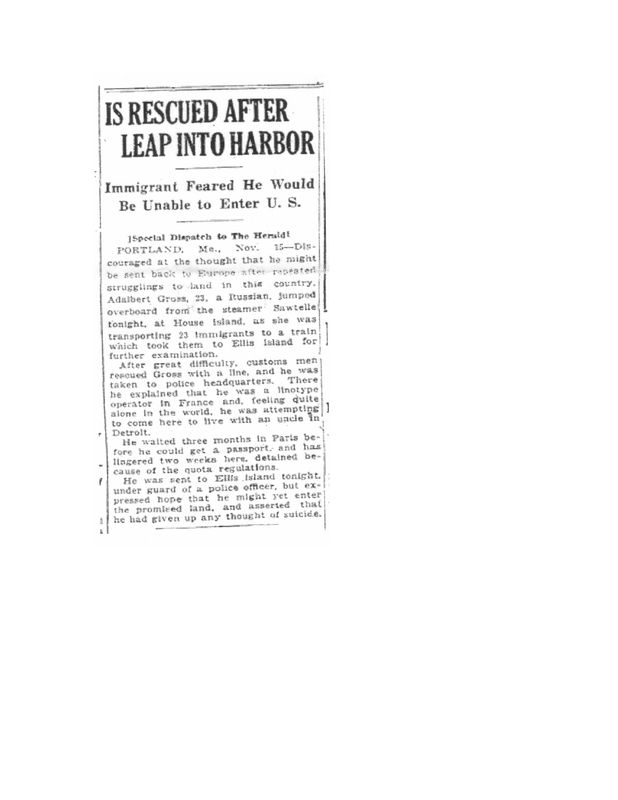 There are 217 untold stories about those held on House Island in 1923 when Bela Gross made his decision to jump overboard. There are other stories of those held at the Quarantine and Immigration Station between 1908 and 1937 when it was closed. We may never hear them. It has been 200+ years since Fort Scammell was erected to protect the entrance to Portland Harbor. President Jefferson, concerned with increasing British aggression, ordered the construction of the second system forts that included Fort Scammel, Fort Preble and Fort Sumner. 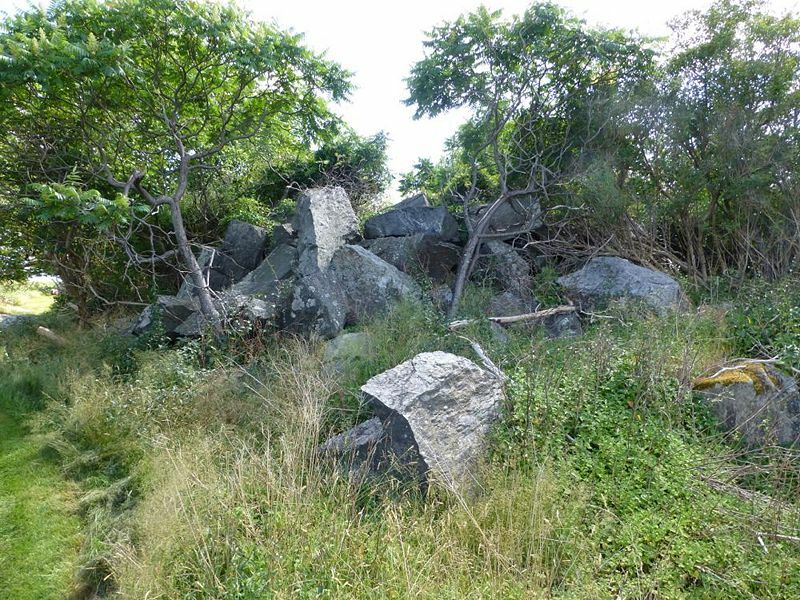 The granite for Fort Scammel was quarried on Mount Waldo and brought by stone sloops to the island. Wharves on the west side of the island were constructed for the off-loading of the stones, as was a stone cutting shed. Stones were unloaded and moved using block and tackle. Not only were the stones for Fort Scammel prepared on House Island, but also the stones for Fort Gorges and Fort Preble. Stones were moved from the cutting area to the east bastion by way of a short narrow gauge railroad. In June of 1812 the United States declared war on England. Fort Scammel was garrisoned during the War of 1812 (1812-1814), but the fort’s guns only fired once in August of 1813 on a British Privateer in Whitehead Passage. A month later in September 1813 a British Flag of Truce party landed at the Fort to negotiate for the release of British prisoners from the HMS Boxer captured after a battle with the USS Enterprise off Pemaquid Point on 5 September 1813. According to Portland fort historian Kenneth Thompson, the British originally planned to invade the U.S. through the Portland Harbor. The presence of the 3 earth and gun battery militia forts proved formidable and the British decided to attack Baltimore instead. Maryland played a pivotal role during the War of 1812, particularly during 1814 when the British captured and burned Washington, D.C. and then made their way toward Baltimore. The British planned to attack Baltimore by land at North Point and by sea at Fort McHenry, which stood in defense of the Baltimore Harbor. It was during the bombardment of Fort McHenry that Francis Scott Key, a Maryland-born attorney brought by truce ship to negotiate the release of an American prisoner, was inspired to write the words to what became the United States’ National Anthem. 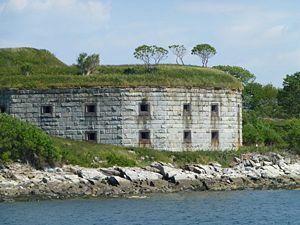 In the 1860’s, Thomas Lincoln Casey was assigned to Maine to oversee construction of Fort Knox and Forts Gorges and the redesign of Fort Scammel and Fort Preble. After the Civil War, he was assigned to oversee construction on the Washington Monument He served as the Chief of Engineers for the US Army Corps of Engineers 1888- 1895 and was the engineer for the Library of Congress’ Thomas Jefferson Building (1890-1897). Some people will look at a slab of granite and see an unused block of stone. But I see the marks made by the hands of men who quarried the stone and constructed granite wharves and forts. Some people will look the remnants of the Quarantine and Immigration Station – the original detention center, the doctor’s residence and the hospital – and see land for development. But I hear the voices of those who came to America hoping for a better life for themselves and their children. Some people will look at a fort that fired only one shot in defense of Portland and not understand its role in protecting the entire bay. But I know that the architecture has more significance and its long history is of greater value than the firing of canon. If you wish to be a part of the conversation regarding the possible historic district designation of House Island and Fort Scammel, PLEASE attend the Historic Preservation Board Hearing at Portland City Hall, Wednesday, October 1, 7:30 pm. This is the first step in a multi phase process. If you are unable to attend, please send comments to Deb Andrews, dga@portlandmaine.gov. This entry was posted in Art, Historic Preservation and tagged Bela Gross, City of Portland Maine, Fort Scammel, granite, House Island, House Island Quarantine and Immigration Center, Judge Winslow, Mount Waldo, Peaks island, War of 1812. Just a quick note to tell you that my father also came on the USS George Washington — but in July 1938 — long after Bela Gross. As a matter of fact, I have 8 menus from that trip — “Koscher Speisekartes” dated July 16-22, 1938 that we found when clearing out our old house. Dad always told us that when he was deployed as an Army physician during the war, he was on the same boat — converted to a troop ship — going back to Europe. Great story on Bela Gross! Well done. Very vivid writing on multiple aspects of the immigration story – really brings it to LIFE! 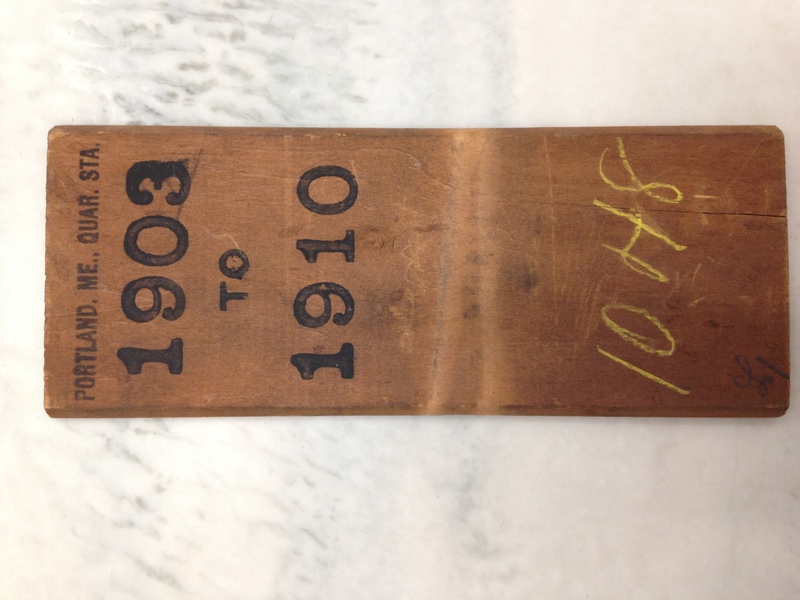 Thanks for such sensitive sharing – a mirror of many of the immigration stories I researched when I did the Life line project at Ellis Island. We are all sons and daughters of immigrants. Good luck on the path! Your research and thoughts have wings through this blog and other avenues. Bravo for sharing these immigration stories/facts. They certainly should impact our collective perspective.